The grassroots site “Alaska Native Languages” emphasizes community as it seeks to save endangered Indigenous languages. A screenshot from the site Alaska Native Languages. The site focuses on serving language learners. Alaska has at least 20 Indigenous languages, many of which are endangered. But a new site is working hard to revitalize those threatened languages. 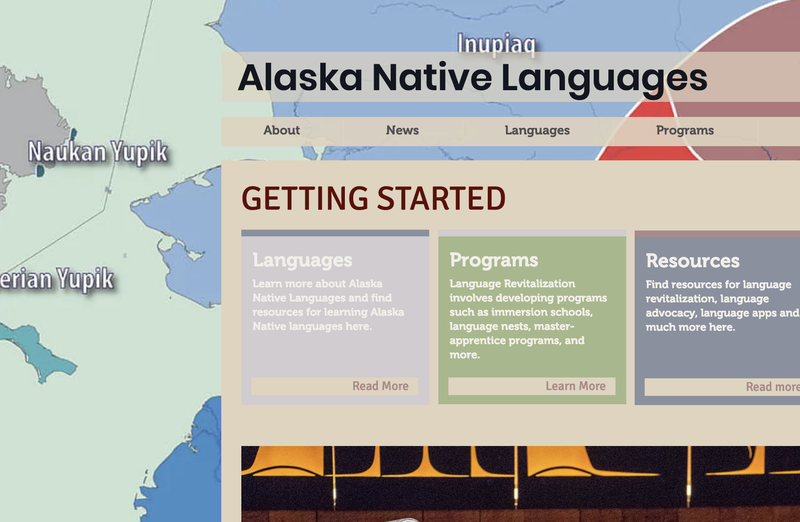 The site Alaska Native Languages, launched last month, includes recordings and information about each Alaska Native language spoken around the state, with a primary focus on compiling resources for language learners. It includes information on programs such as immersion schools and master-apprentice programs, resources on language advocacy and revitalization work, and information like language apps and upcoming events around Alaska. “People could go [to the site] to find research, or grant information, or connect with others” says Myles Creed, who is one of the main contributors to the new website — and also known for his work adding Inupiaq to Facebook. The new website came about through the work of many Alaskans, including Creed and Veri Di Suvero. Though the website was first released by Creed in 2016 as a part of a smaller project housed by the Alaska Humanities Forum, the project has left AHF and become the work of both since the winter of 2017. Together, they have been working to build the website into a full-purpose resource for language learners. Previously, no work had been done to catalogue the number of different language programs around the state. Getting the website up and running took hours of research, interviews, and conversations with Alaskans across the state in order to compile a comprehensive resource of Indigenous language programs statewide. The website “doesn’t focus on a particular language family; it focuses on a region” says Di Suvero. As the first regionally-focused resource of its kind in Alaska, Alaska Native Languages emphasizes the unique situation of Indigenous languages across the state. Di Suvero sees this diversity as a strength, allowing language learners anywhere in the state to view programs that are offered in their communities. The first resource that can direct language learners to relevant programs statewide, Alaska Native Languages offers an opportunity for language learners that may not know where to begin. This language revitalization work comes on the heels of a significant Alaska development in the area of language revitalization: In September, then-Gov. Bill Walker signed an emergency order declaring the promotion and preservation of Alaska Native languages of the utmost importance. The declaration of a linguistic emergency was prompted by a report from the Alaska Native Language Preservation and Advisory Council which urged the Governor to “recognize the linguistic emergency that exists” and take action to ensure Alaska’s Native languages not just endure but thrive well beyond the 21st Century. Language revitalization is a pressing issue — not just in Alaska, but across the Arctic and the world. In the circumpolar Arctic alone, there are more than 50 Indigenous languages. Across the globe, there are 2,680 Indigenous languages considered to be in danger. That’s why the United Nations declared 2019 the Year of Indigenous Languages. “Languages play a crucial role in the daily lives of people, not only as a tool for communication, education, social integration and development, but also as a repository for each person’s unique identity, cultural history, traditions and memory,” a U.N. release on the subject said. Though the U.N. has not pledged any financial support to work being done on the Alaska Native Languages site, Di Suvero notes that “there is momentum” following the declaration as well as the work being done in-state. However, with a new governor and administration in Alaska, government support is still up in the air. And it remains to be seen whether the United Nations’ proclamation will help Indigenous language revitalization efforts in Alaska. That’s why the contributors to this page made a conscious effort to house the website outside of any organization, non-profit, or even governmental structure. “I think a lot of times when things are grassroots… there’s a little more creative freedom and room to get things done a little quicker” says Creed. This is a hallmark of the project, and a strength, according to both. The website is “meant to be a resource by community members, for community members,” according to Di Suvero. This way, the longevity of the project is ensured by the contributions of passionate volunteers rather than financial support, any one state administration, or even simply turnover or changing priorities within an organization. The decision to remain separate from any single institution reflects the overall focus of the site on community. Because the resource is built to be used by language learners — not linguists or researchers — and because it aims to revitalize languages, it focuses on community-specific opportunities to learn or further language skills. In turn, the growth of the site as a comprehensive resource depends on community investment and knowledge that this resource exists. “It is still a work in progress; we’re hoping to get more feedback from community members about programs in their areas” says Di Suvero, of the future of the site. But Creed and Di Suvero also hope the site brings opportunity to Alaskans across the state, regardless of the languages they speak or wish to learn.